Pleasant Valley, Louis Bromfield. Wooster: Wooster Book Company, 1997 (originally published in 1945). Summary: The author, a Pulitzer Prize winning novelist, narrates his return from France to the area he where grew up, his purchase of several worn out farms, and his pioneering efforts in sustainable agriculture that restored the land to fertility, bringing health not only to the land but to those who made it their home. One of my favorite parts of Ohio, my home state, are the lush rolling hills of north central Ohio, a mix of small towns, forest and farmland. Malabar Farm, once the home of Louis Bromfield, a 1927 Pulitzer Prize winning novelist, continues to this day as a working farm operated as a state park. I’ve camped on its land with my son’s Boy Scout troop and toured its Big House (Bogart and Bacall were married there) and outbuildings. But until now, I had never read the story of this place by Bromfield himself–having only just found a copy on a birthday trip to a used bookstore. 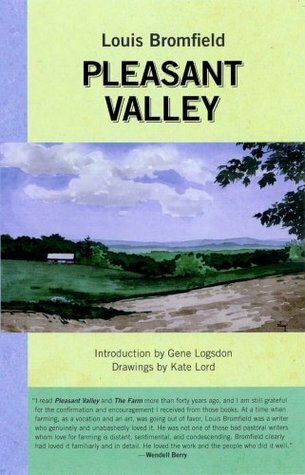 Pleasant Valley is Bromfield’s narrative of his return from France to fulfill a lifelong dream of farming in the valley where he grew up. He purchased several old worn out farms and began the process of restoring soils to fertility, putting into practice progressive agricultural practices like contour planting, using cover crops to hold and restore the soil, restoring woodlots, and tilling and disking his fields but not plowing to leave a cover which, along with manure, and cover crops would hold moisture and the soil itself. Eventually, he acquired roughly 1000 acres, and provided a sustainable life for the 35 or so people and hosts of pets and livestock who shared the land. He described the building of the Big House, adding on to an original structure and creating a place that could accommodate a celebrity wedding, a study where he could write and think, and a home where children and his pet boxers could live rambunctiously and joyously. Through his description, we see the contoured strips of plantings, the healthy livestock, the pond where the boys went skinny-dipping. We share in his wonder as he discovers springs of water once again coming forth, a sign that the soils of his land are retaining water which is going down into the water table that feeds these springs. Bromfield believed that the health of the soil was the health of the people. In addition to narrative, he gives us trenchant commentary contrasting living and dead farms, the follies of modern agriculture, and the potential to feed a far greater nation if only we would care for the foundation of our agriculture, the land. He was Ohio’s Wendell Berry, articulating a vision of attentiveness to the soil, and a sense of place, a generation before Berry began writing. “As I watched that big work-worn hand caressing that stalk of corn, I understood suddenly the whole story of Walter and Nellie and the ninety acres. Walter was old now, but he was vigorous and the rough hand that caressed that corn was the hand of a passionate lover. It was the hand that had caressed the body of a woman who had been loved as few women had ever been loved, so passionately and deeply and tenderly that there would never be another woman who could take her place. I felt again a sudden lump in my throat, for I knew that I had understood suddenly, forty years after the woman was dead, one of the most tragic but beautiful of all love stories. I know now what Robert’s strange remark about Nellie and the ninety acres getting all mixed up had meant. Robert himself must once have seen something very like what I had just seen” (p. 154). Louis Bromfield returned to Pleasant Valley seventy years ago. Yet this narrative has a timeless quality about it because it deals with one of the most basic and elemental realities from which we cannot escape. We discover in these pages the joy and deep satisfaction of caring for the land and the place that in turn gives us our life. Even those of us who live in cities have deep interests in this project, whether it is in the tending of our little garden plots and protecting against runoffs of fertilizers into our watersheds, or in the health of farms around us that provide us our produce, milk, meat, and eggs. All of us will either just use this place or love it. Bromfield inspires us to the latter.